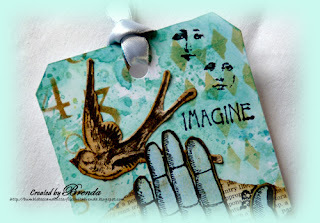 There is a new challenge at Fashionable Stamping Challenges today with a theme of Magical and Mystical. So what are you making over the next fortnight that could link in? 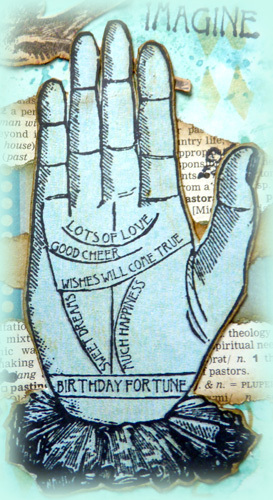 My tag is around the clairvoyant, extrasensory and fortune telling aspects of the magical and mystical theme with a focus on 'Birthday Fortunes'. 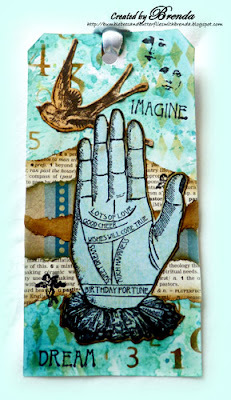 My stamps are Paper Relics and Invoke with a distress ink 'spritz and dip' background. A little extra patterned and dictionary paper to create the collage effects and I didn't think it needed any other embellishments. Have a wonderful Sunday and I hope you are enjoying the Jubilee weekend if you are in the UK - shame about the weather isn't it? A wonderfully original Tag, that is so interesting. The hand is imposing and forces yo to look at it, and your Bg is designed so well to add such texture and movement to the piece. Hi Brenda...Wow! What strikes me most I think is the balance with the colours and how the hand looks like it is leaping off the page...great effect! You are right, if doesn't need any more added, the inking is so creative on it's own. Gorgeous Brenda. Love your fabulous tag Brenda. You certainly know how to balance the images to bring it all together. Fab creation, Brenda...enjoy your Sunday! 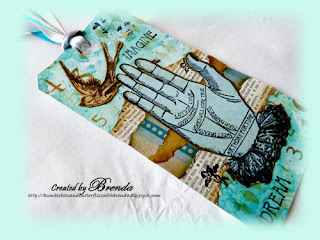 Brenda, that's a wonderful take on this challenge, your tag looks fabulous, great images. Brenda, your tag is PRICELESS!!! Love, love, love it! fabulous tag! love the colors and the composition! Fantastic tag Brenda, love the images with the lovely background. Brilliant Brenda; what a fab tag ! How fabulous, Brenda! Love that stamp and the gorgeous background you've made for it. Fabulous, so original and striking. Love it! Oh this is just too darn cool, Brenda! I so love that hand! Great collaged images and colors for the background! Love it! Hugs! Brenda this is amazing its like a painting !!! Such amazing work, colours,design,stamping it has everything, love it !